A time of sorrow requires a supportive expression of comfort. 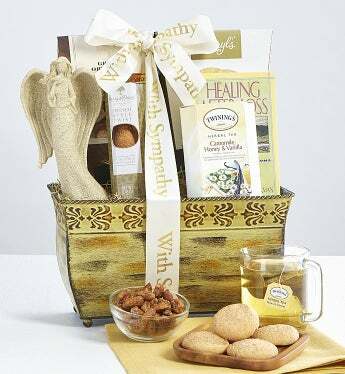 This elegant embossed gift basket offers a resin remembrance Angel figurine as well as the Healing After Loss: Daily Meditations For Working Through Grief book, an array treats and Twinings® Tea. The finest way to express and extend your support to someone you care for during this difficult time.